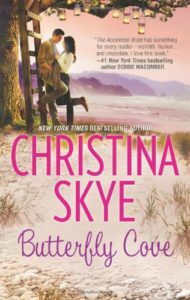 Thanks to all of you who enjoyed Rafe’s and Olivia’s journey of trust in BUTTERFLY COVE. Rafe was kind enough to share his favorite recipe with you. Try this for knitting night. Or book club night. Or anytime you want a great burst of flavor. Just be careful. It is addictive…. Forget about salsa. This knocks salsa out of the competition. Try it with chips. With rice. With lettuce wraps. With English muffins or black bean soup or chili. As a topping on salad or a hamburger. The ingredients are limited, but be sure your avocados are newly ripened and with no bruises. It’s all about the avocados! And please – only white onions. Not yellow. Not red. Definitely not Vidalia. Chop white onion. Add chopped pepper. Mix in salt. Cut avocados in half, remove skin and mash slightly, leaving chunks for texture. Toss with vegetables. Add fresh lime juice and mix well. Sprinkle with cilantro and enjoy immediately. PS. Here is Rafe’s secret sauce: Grill the poblano first. No oil needed. After the skin is blackened, let cool and then scrape off the outside layer, the inside membranes and the seeds. Proceed as above. This adds a huge flavor pop and makes the dish absolutely stellar. Enjoy! Download the recipe card for BUTTERFLY COVE.